Count me in as someone who loves Girl Scout cookies! I even used to love Edy's special addition Girl Scout cookie flavored ice cream. But that's another story. 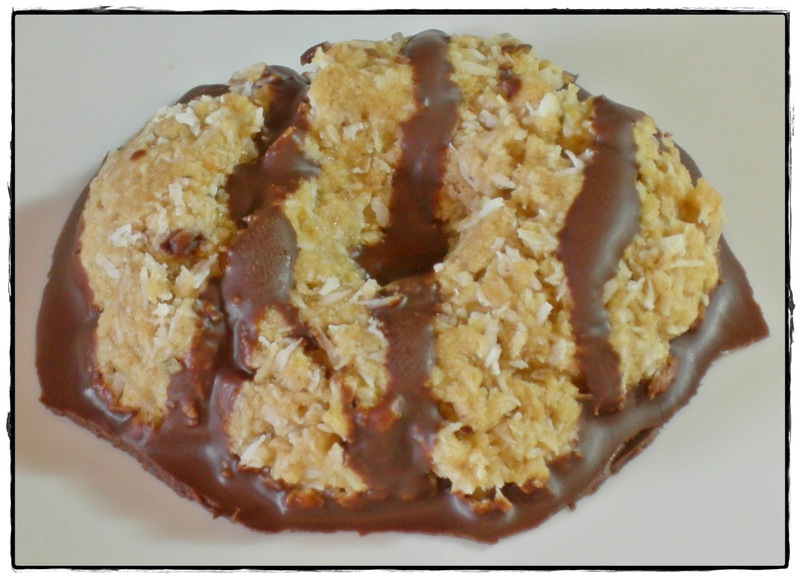 ;-) I came across a recipe for Samoas that was already vegan, but I wanted to cut down on the sugar and make it refined sugar free. This version doesn't have the shortbread base, but everything else is the same. 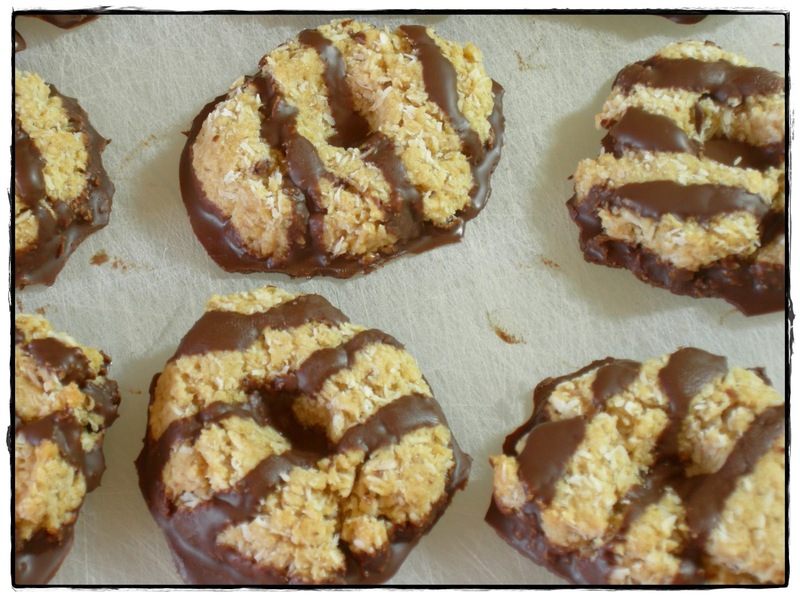 If you're a Samoa fan, you're going to love these! 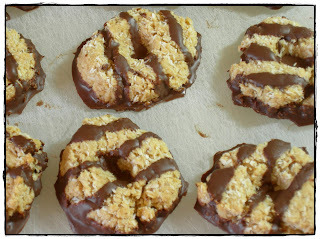 This recipe is adapted from Vegan Cookies Invade your Cookie Jar. *You can substitute oat flour to make these Gluten Free. I tried it and it works beautifully! Preheat oven to 350. Line two baking sheets with parchment paper, set aside. In a large skillet, over medium/low heat, toast the shredded coconut until it turns a light golden brown, about 8-10 minutes. Stir occasionally, careful not to burn. Remove from heat and stir occasionally as it cools. In a large mixing bowl, combine coconut oil, maple syrup, flax seeds and vanilla. Stir until smooth. Mix in the flour, baking soda & salt until a thick batter forms. Stir in the toasted coconut. Scoop 1 tbsp of dough onto the baking sheets, about 2 inches apart. Flatten each cookie with the back of a measuring cup and make a small hole into the center of each with your fingertip. Bake for 8 minutes, until the edges of the cookies are golden brown. *They will still seem soft when you take them out of the oven, but will continue to harden as they cool. Let the cookies cool on the baking sheet for 5 minutes, then transfer them to a wire rack to cool completely. While the cookies are cooling, melt the chocolate chips on either the stove top or microwave. Stir in the coconut oil. Allow the mixture to cool for 5 minutes to thicken up. Line a firm surface (that can easily be slid into the refrigerator), like a cutting board, with parchment paper. Dip cookie bottoms into the chocolate, allow excess to drip off, and place them on the waxed paper. Once all cookie bottoms are dipped, drizzle remaining chocolate over the cookies using a fork, spoon or by pouring the chocolate into a pastry bag fitted with a very small round tip. Place cookies in the refrigerator for at least 30 minutes to completely firm up the chocolate. Store cookies in a loosely covered container in the refrigerator. Holy cow, these look amazingly delicious! I don't own that cookbook, so I'll have to bookmark this recipe. 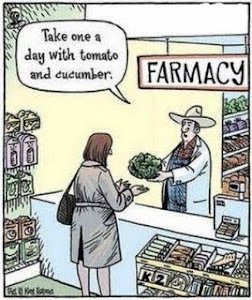 Thanks, Christine! You really described them perfectly, Ingrid! :) They taste exactly like the real thing!